I wanted to revive this post today, for mothers across the pond. In many parts of Europe, Mother's Day is celebrated in March. This took getting used to, when I first moved to Paris in 1996, because this event had always been in May, back in South America. Last year I found these brilliant pieces of edible arrangement and shared them on another blog. Flowers have always been a very welcome Mother's Day present. Mothers all over the world (here in March, and on the other side of the globe, in May) are given rushed, last minute bunches of flowers when all other original ideas for mother's day presents have been exhausted. Nowadays you can give your mother flowers for mother's day (or any other occasion) and still give her an original gift in the mix. This is where edible arrangements come in. 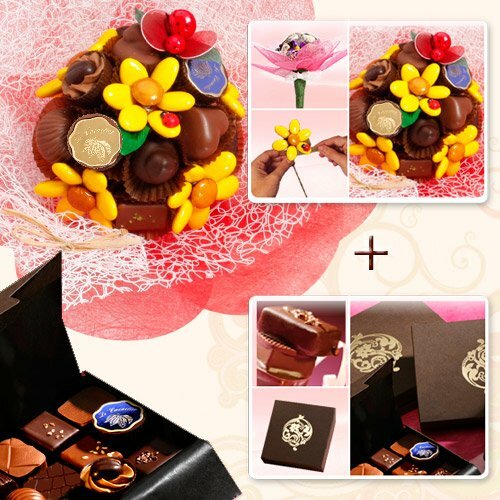 This milk chocolate arrangement comes in a delightful package, in all kinds of shapes and sizes, with a fantastic array of colours and flavours. It's an unforgettable bouquet. For mothers who can't eat chocolate, or those who like fruit better, here is a splendid arrangement of Fruit Bouquets, Delicious Designs for her. This book inspires you to create the most wonderful edible flower designs. Not only can she admire the setting and arrangement, when she feels the need for a healthy snack, she can tuck in to her heart's content. And what about the woman who loves reading? This is the ideal edible arrangement! Little Book (Box of 28 Luxury French Chocolates , 7.5 Oz) The packaging are natural wooden boxes which can be used for storage once the chocolates are all gone. Now, here's one you can easily do yourself. You get the instructions with colour pictures to help you make the perfect home made, edible arrangemen t. This one is not just for your mother, but will come in handy for get-togethers, weddings and birthdays all year round. This last one is really exciting. It shows you how to make a large variety of edible centrepieces . Why not make one specially for your mother and blow her away with your talent and dedication. Anyone can do these. The directions are simple and straightforward. This is the perfect edible gift any mother would like to receive. Now that you have the links, go ahead and see what you can do to make mother's day special for your mother!